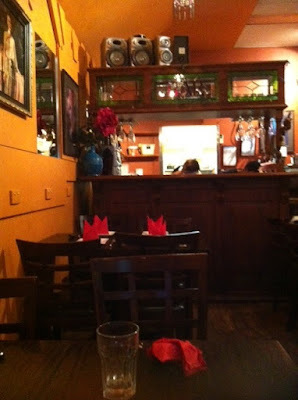 A little while ago, Tim and I again dined at Il Solito Posto (meaning "The Usual Place"), an Italian restaurant entered via a Melbourne laneway. You can read about our first visit here. It was absolutely scrumptious. I particularly loved the mozzarella balls. It tasted as wonderful as it looks, with plenty of sauce to flavour the filling. Il Solito Posto is a terrific place to enjoy good Italian food, but I recommend booking - they always seem to be very busy. There is a free food newspaper called Gram that is found at various locations aorund Melbourne. Tim always picks up a copy for his Dad. 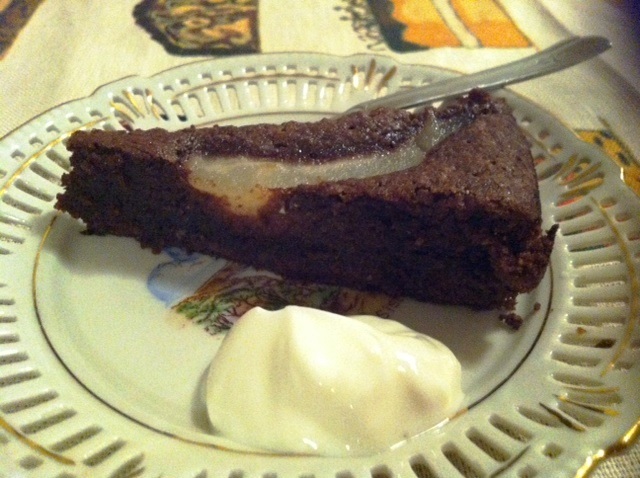 In one recent edition, Tim found a recipe for Pear and Chocolate Cake that he thought I'd like to make, and sent me a copy. The cake was from Florentine by Emiko Davies. I was also impressed with the sunray pattern on top of the cake formed by the pears - so easy to do yet so effective. It was a gorgeous cake, and I would definitely make it again. I own Lola Berry's The Happy Cookbook. It contains some really good recipes for those times when I am trying to eat a little bit more healthily. I have previously made Lola's Paleo Chocolate Celebration Cake and her Fig, Peach and Cardamom Paleo Loaf from this cookbook. This time, I decided to make one of her savoury recipes, and chose Lola's Beef, Broccoli and Cashew Stir Fry, the recipe for which is online here. This recipe is unlike the stir fries that I normally make because there is no sauce added to it - you just have the juices from the vegetables and meat. I worried that this would make the stir fry a little lacking in flavour, but it surprised me - it was so simple yet so tasty, and no sauce was required. 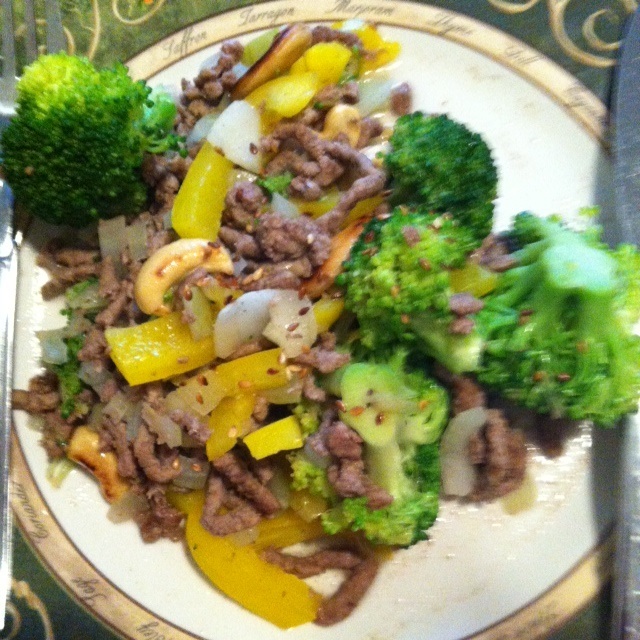 I would definitely put this stir fry on regular rotation as a light, healthy main meal. One recent Sunday night, Tim and I were off to the Madonna Rebel Heart Tour concert at Rod Laver Arena. The concert didn't start until 8pm (or had we known at the time, much later), so we started off our evening with dinner. In keeping with the Italian flavour of the evening, we decided to go to Vapiano, a pizza and pasta restaurant for which I had a discount voucher in the Entertainment Book. 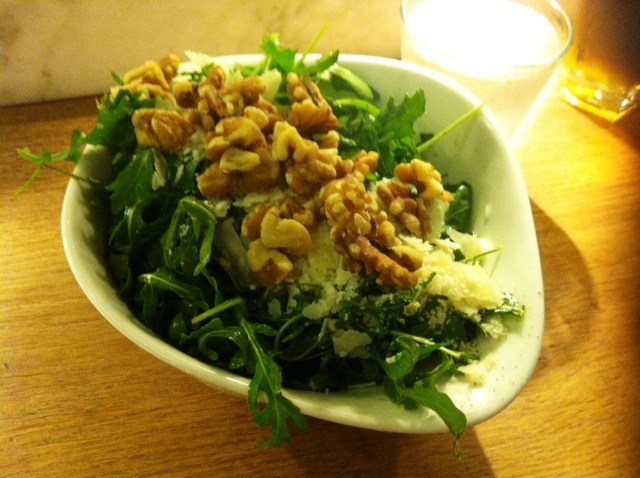 Vapiano is very informal. You can't book, and there is no table service. You choose your own seat, and order and pay for your food at the counter. Once the food is ready, you go and pick it up yourself at the counter. For pasta, you choose your own pasta and sauce, and whether you want garlic or chilli or both, and they cook it on the spot. It was surprisingly delicious. There is a bar with a large selection of beers and wines to accompany your meal. 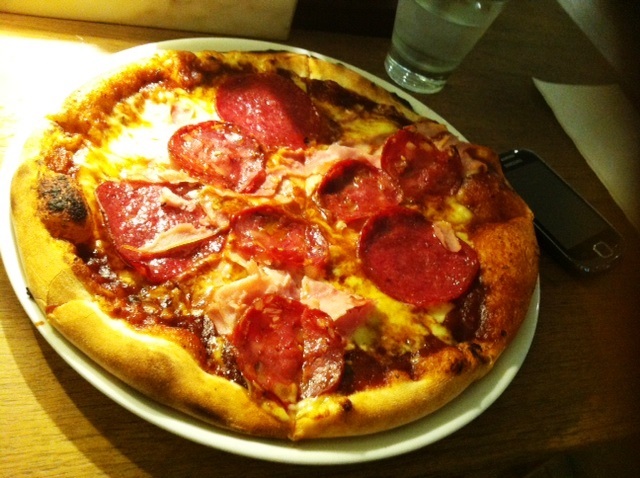 Vapiano became very busy very quickly, so I recommend going early. 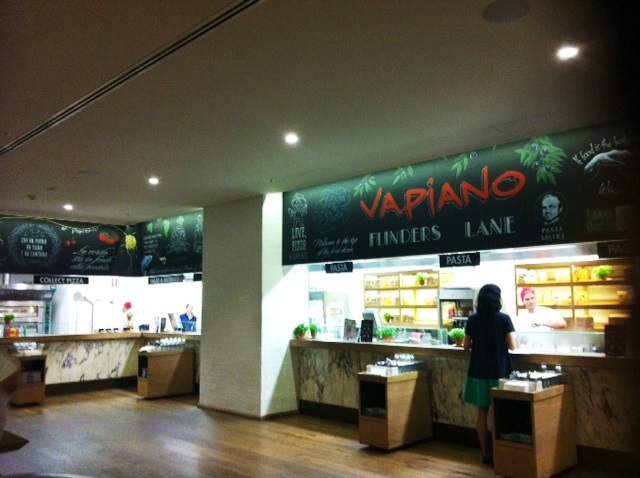 I prefer a restaurant with table service, but the food at Vapiano was quite good and reasonably priced. We would go again. 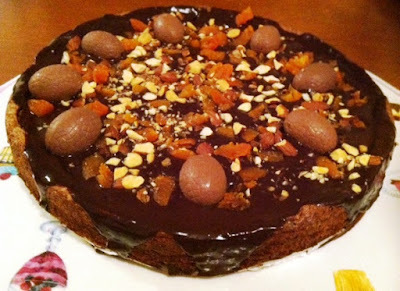 In the Sunday newspaper magazine this week, Adam Liaw had published a recipe for Chocolate and Almond Easter Cake, a cake of Spanish origin known as Mona de Pascua. It looked irresistable, so I decided to make it this week. The dense chocolatey glaze on top really made it. It was really "the icing on the cake". This year they are all pink and are flavoured with raspberry flavouring. 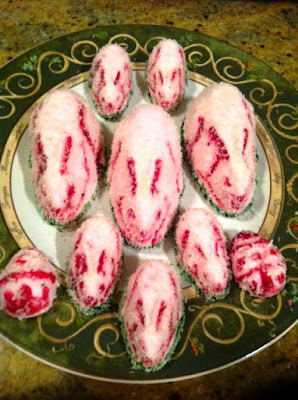 I also made some little "eggs" in my silicone egg mould. 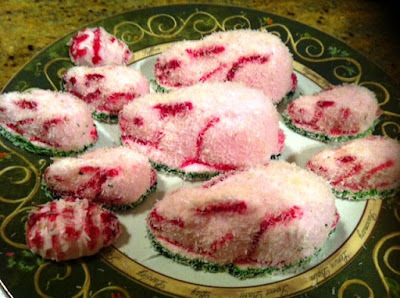 If you want to make your own bunnies for Easter, the recipe is here. 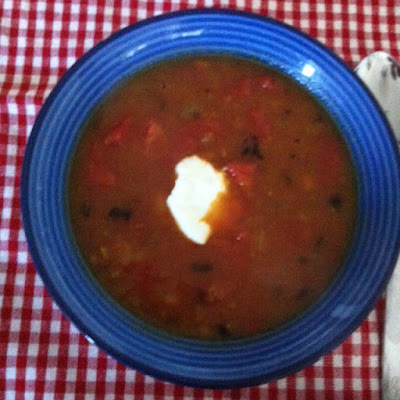 Our theme for Eating with Ellie this week is Super Soups, chosen by Chaya. Regular readers will know that, scarred by childhood condensed soups, I am very wary of soup. However, I have had some very good soups in the US, and my choice from Weeknight Wonders this week was a US style soup - Curried Pumpkin and Tomato Soup. I adored this - it had just the right amount of kick to make it interesting, and the flavours melded beautifully. To see what the others made for Super Soups, visit the LYL section of the EwE website. You know that autumn is here when the mornings become nippy and dark. We have been having a run of lovely days, but the mornings are a reminder that they won't last. I have been trying to make the most of the last of the summer fruit, and recently picked up some figs from the supermarket. I had best intentions to make a fig clafoutis tart that I had seen on the SBS website, but when I went to make it, I realised that I didn't have any cream. 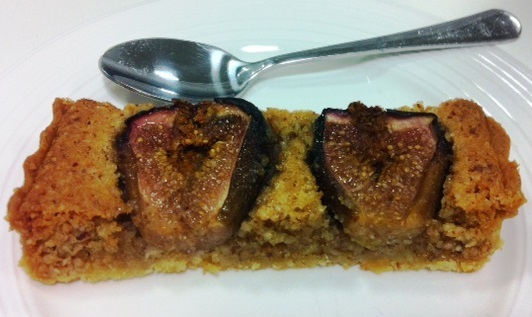 Instead, I decided to make a fig and frangipane tart for which I had all of the ingredients. The tart recipe that I chose was this one, but I skipped the raspberry sauce. I also took a shortcut on the pastry - I had frozen the leftover dough from Adam Liaw's Bondi Meringue Pie, and so I used that as the base for the tart. The resulting tart was just gorgeous - a melt in your mouth, fruity spectacular. 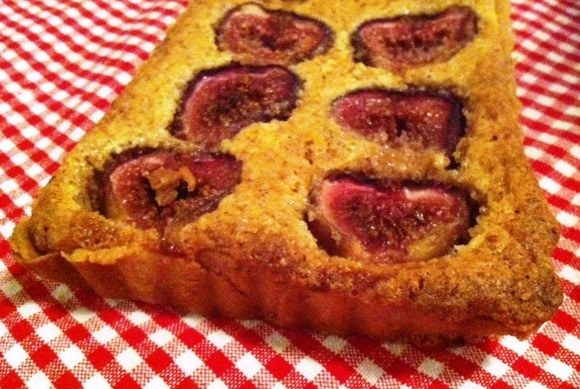 The figs had become jammy and soft in the oven, and the buttery frangipane set them off nicely. It was a worthy send-off to summer. 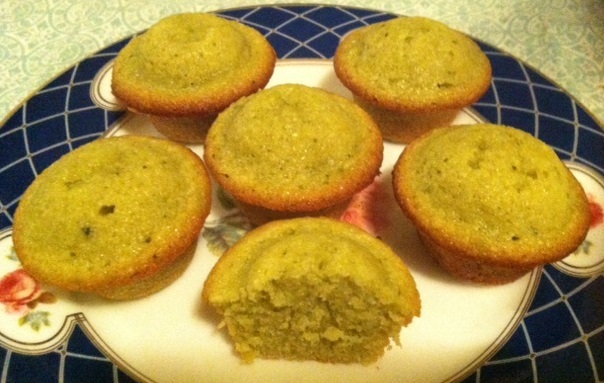 The second March recipe for Tuesdays with Dorie is matcha financiers. I have seen a lot of recipes using matcha, but didn't really know what it was, and I had never tried it before. Matcha is a fine Japanese green tea powder, and it is very pricey - I won't disclose how much I paid for a tiny container of matcha, but it was way too much. I will be trying to make lots of matcha recipes in the future to use it all up, as it is too expensive to waste. 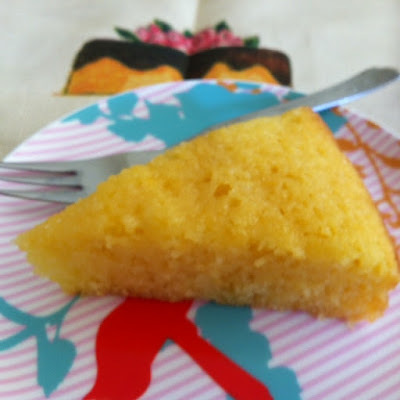 I made a half recipe of financiers, primarily because the full recipe requires 6 egg whites - a rather extravagant use of eggs in my house, especially when the yolks (which don't freeze well) are not required. 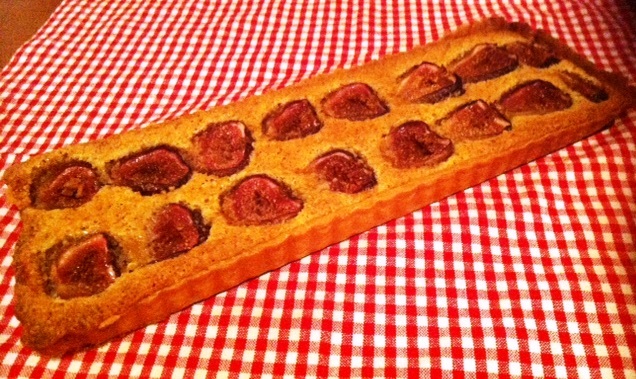 I knew I had three whites in the freezer from my tiramisu, which lent itself perfectly to a half batch of financiers. I thought that these financiers were rather tasty, but I can't say that I really noticed the matcha, other than for the green colour it gave the financiers. 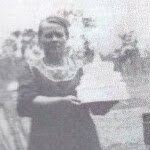 To see what the others thought of this recipe and the alternate recipe, Odile's Fresh Orange Cake, go to the LYL section of the TWD website. Tim likes panettone and tiramisu, so when I saw a recipe for Panettone Tiramisu in The West Australian while on a work trip late last year, I knew I had to make it for him. The recipe was in a special on TV chefs' Christmas recipes, and can be found online here (keep scrolling down until you get to it). It worked beautifully in this recipe. 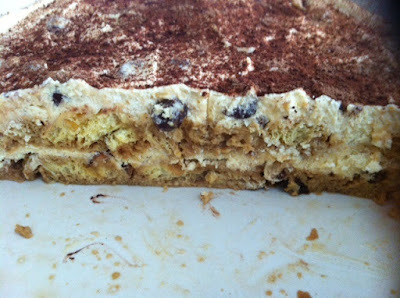 I am not sure how many people Tania and Christina were feeding with their tiramisu, but the recipe is massive. 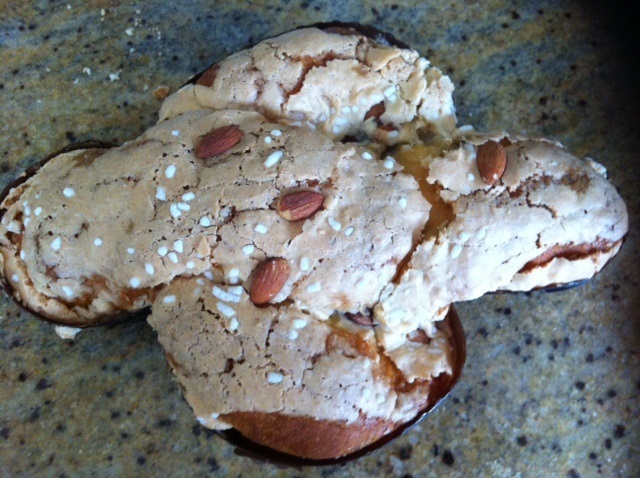 I halved everything except the panetonne, for which I used roughly the same quantity (that is, the whole 750g dove cake). 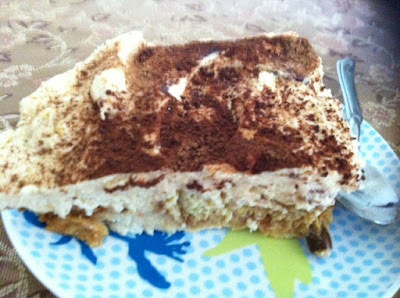 My tiramisu still ended up quite massive, so I highly recommend taking the same route of halving everything but the cake. I was meeting Tim for a Madonna concert (yep, she was fabulous), so I took some tiramisu for both of us in a takeaway container, which we ate before the concert on a public bench tucked in a laneway with plastic forks while we did a spot of people watching. It doesn't have to be fancy to be good! 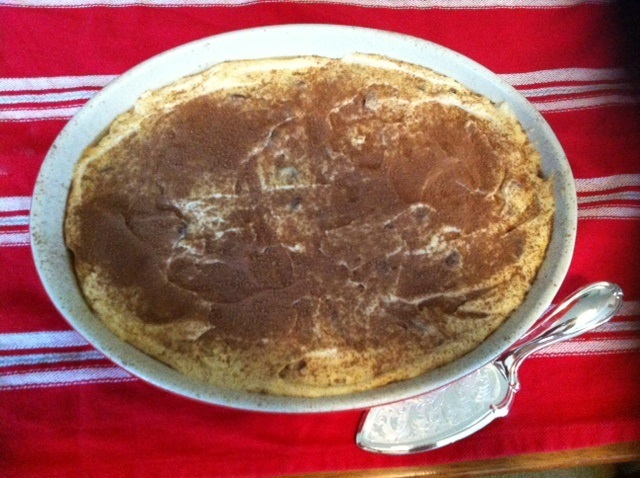 Because of the panetonne ingredient, this was an expensive version of tiramisu to make, but you can cut down on costs by making your own panettone. 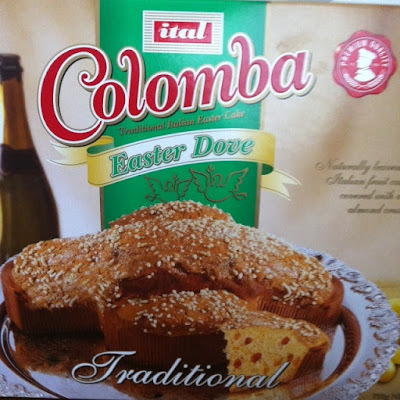 Alternatively , you can use that dry old store bought panettone gifted to you at Christmas - this is a perfect way to use it up if you are not a fan of the panettone itself. 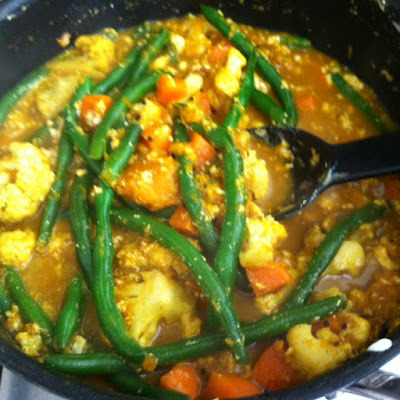 I like a good curry, and as a change for work lunches recently, I made Michelle Bridges' Vegetable and Tofu Curry. 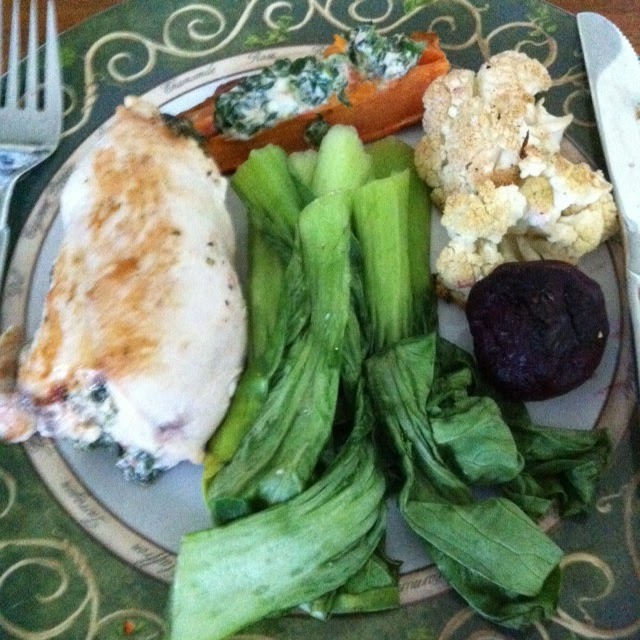 I got the recipe from her book, Total Body Transformation, but you can find it online here. 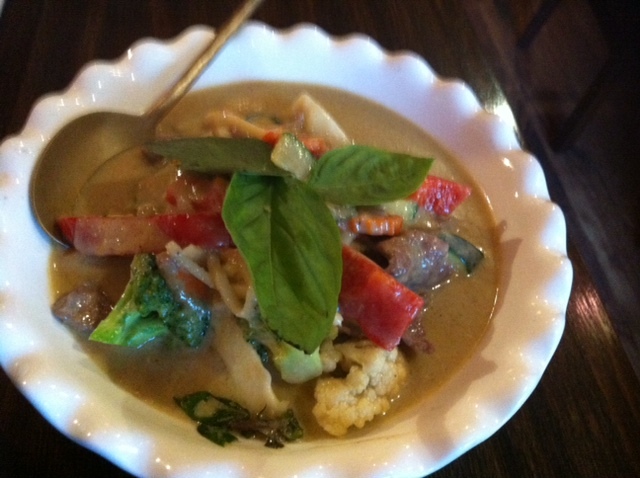 The flavours are bold and there is enough body from all of the vegetables in the curry to make it quite hearty. It is also low in calories, so it is a pretty healthy lunch. It doesn't look that attractive, but if you like curry, this could be a way for you to enjoy it regularly without dialling up the fat and calories. 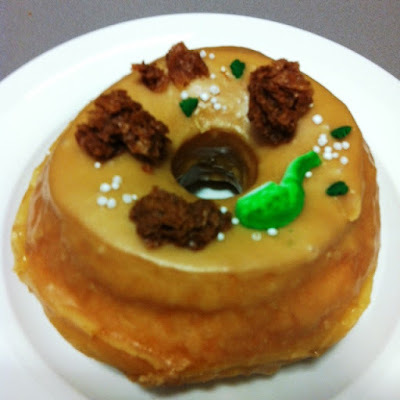 The Liam Neeson from Doughnut Time with Baileys glaze, caramelised biscuit and shamrocks. For Eating with Ellie this week, Margaret chose the theme of "Eat More Chicken". 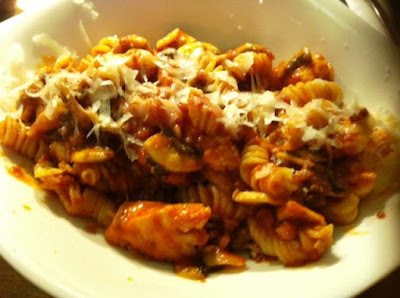 Ellie has lots of fab sounding chicken recipes in Weeknight Wonders, so the hardest part this week was choosing just one. I went for Ellie's Chicken Florentine Roll-ups, mainly because I had goats cheese left over from last week's recipe that I didn't want to waste, and this recipe happened to use it. 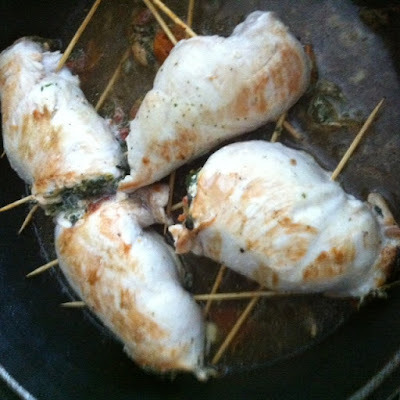 These roll-ups were so delicious - they comprised chicken breasts filled with goats cheese, spinach and sun-dried tomatoes. Seriously good! 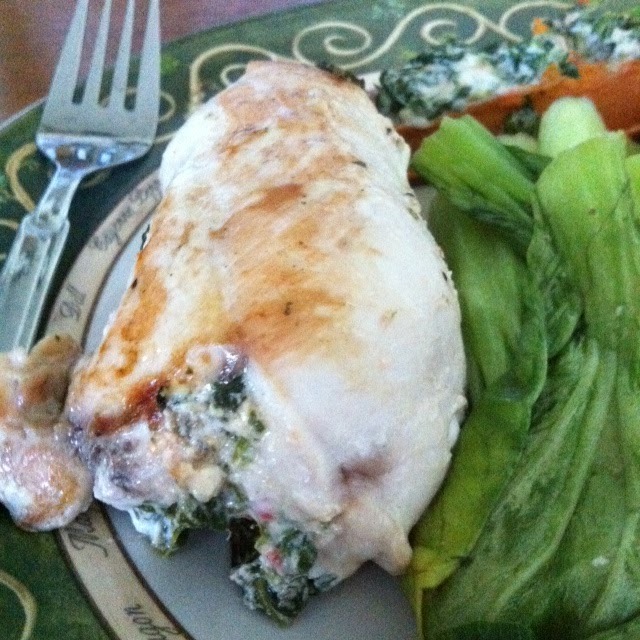 The chicken was moist and tender because it was braised in chicken broth. To see what the others made of this week's theme, visit the LYL section of the EwE website. 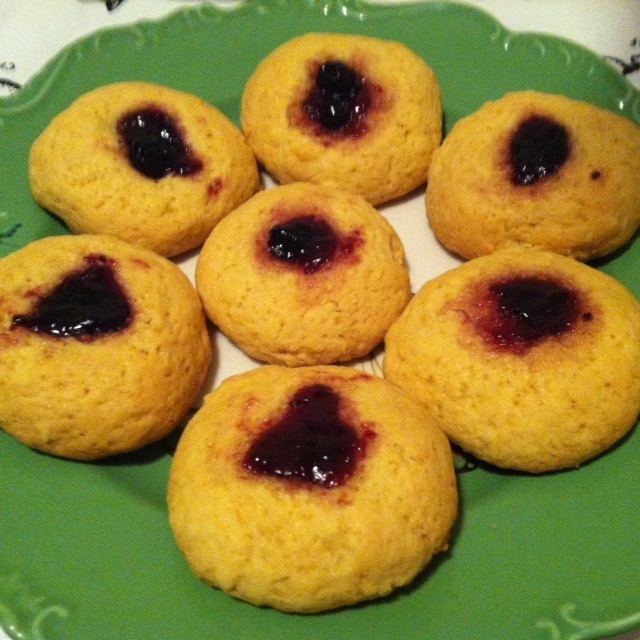 Recently, a colleague and I went to a function where they served jam drops (or thumbprints, as they are known in the US). The jam drops were a little too flat and pale for my liking. When my colleague indicated that she didn't know how to make jam drops, I was inspired to make a batch of jam drops for her. I never really think about baking the staples that I grew up with because they are interwoven with my identity - they just are. However, I was jolted out of this by my colleague, at least in respect of jam drops. The recipe that I used was a handwritten one that I copied out of Day to Day Cookery by I M Downes when I first moved out of home. This was my home economics textbook, which my mother commandeered once I had finished with it. I have added a few extra details below, because I M Downes has assumed that people know quite a bit about baking in her recipes. Beat the butter and sugar to a cream (that is, beat them in a stand mixer until light and fluffy). Add the egg to the mixture and beat well, then add the vanilla extract and beat to combine. Gradually add the sifted flour and salt to the mixture, and mix into a smooth paste. Roll the mixture into walnut-sized balls, place them on a lined baking sheet about an inch apart and make a hollow in each one with your forefinger. Add just enough jam to each hollow to just cover it - don't add too much or it will ooze out during baking. Bake the biscuits in a moderate oven (that is, 180 degrees Celsius) until golden on top (~12-15 minutes). Remove the biscuits from the oven and allow them to cool on the baking sheet. In Australia, Wagon Wheels are a chocolate biscuit treat, comprised of two chocolate coated biscuits sandwiched together with raspberry jam and marshmallow. The closest US equivalent that I know of is the Moon Pie, but the Wagon Wheel is a larger and more luscious affair. When I was at my dentist a couple of weeks ago, the cover of the March 2016 edition of Delicious magazine caught my eye - there on the cover was the most decadent looking Wagon Wheel Slice. However, you cannot judge a book by its cover, and a flick through the magazine revealed that this was a "wholefoods" version of Wagon Wheel Slice, with no flour or chocolate in sight. I bought the magazine to give this slice a go, as I was intrigued by the possibility of a "healthy" version of the Wagon Wheel. This slice would be quite expensive to make if you didn't already have most of the ingredients - I did, so this aspect was not a problem for me. 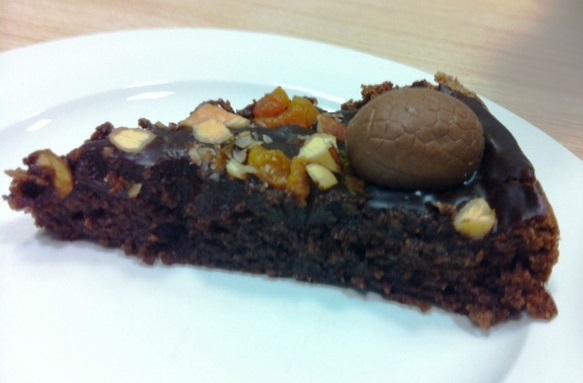 The finished slice looks the part of a Wagon Wheel, but it tastes quite different. It is not particularly sweet, and the "marshmallow" has no sweetener added to it at all. Everyone remarked that they enjoyed this slice, but if you are expecting the full on sweetness of a Wagon Wheel, you will be disappointed (as I was). It is much more like a health food bar in flavour. If you cannot indulge in treats like Wagon Wheels or your own dietary inclinations won't allow you too, but you secretly enjoy such treats, this slice could be just the ticket for you. 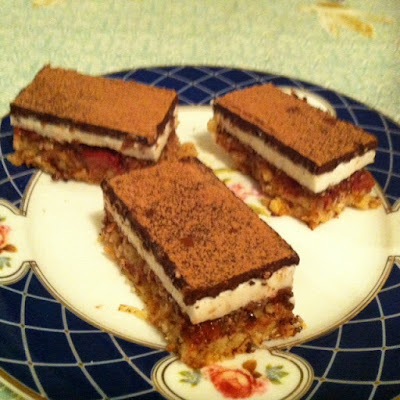 For me, I would prefer to indulge in the more decadent versions of Wagon Wheel slice. You'll have to make up your own mind. Preheat your oven to 180 degrees Celsius. Grease and line a 12cm x 22cm x 5cm deep slice tin. 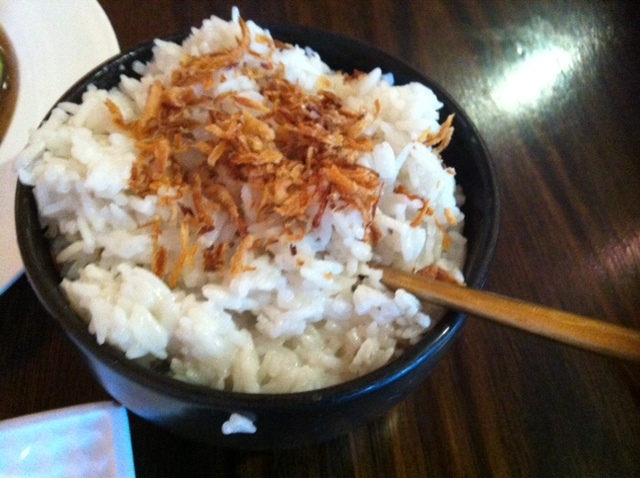 In a small bowl, combine the almond meal, shredded coconut, rice malt syrup, egg and 80ml of rice malt syrup. Press the mixture into the base of the slice tin. Bake in the oven for 20 minutes or until golden. Remove from the oven and cool in the tin. Make the jam by putting the strawberries, rice malt syrup and vanilla in a small saucepan and cook over medium heat for 10 minutes or until slightly broken up. Remove from the heat and fold through the chia seeds. Allow to cool completely before spreading over the almond meal base. Chill for 30 minutes to set. Soak the gelatine leaves in water for 5 minutes to soften. Heat the coconut cream in a saucepan over medium heat. Squeeze the excess water out of the gelatine leaves and add to the coconut cream, stirring until melted and combined. (I used powdered gelatine according to the instructions on the tin instead with no problems.) Strain the mixture and allow it to cool to room temperature. Pour the coconut cream over the strawberry jam on the slice base and chill for 3 hours or until set. Combine the cacao powder and 170g coconut oil in a bowl and stir until smooth. Place the chilled slice over a lined baking tray. Pour the cacao mixture over the top of the coconut cream, then work quickly to spread it evenly over the top of the slice. Allow to set at room temperature for ~ 20 minutes. Once set, dust with extra cacao powder, and cut into pieces to serve. 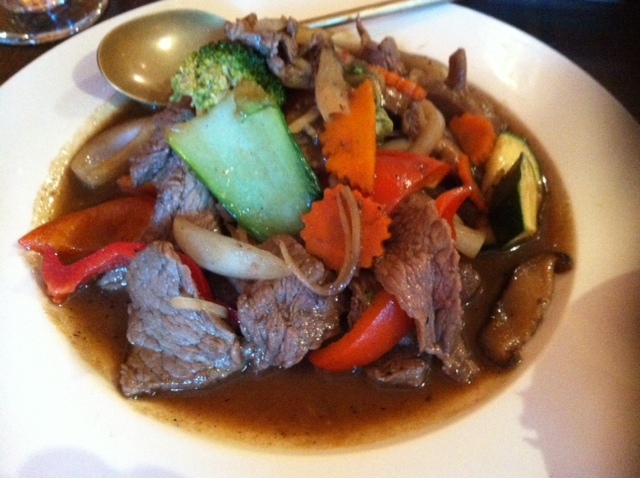 One of our regular restaurant haunts is Thai on High in Armadale. I adore Thai food, and Thai on High's versions of well-known Thai dishes never fail to disappoint. It is a hot evening, so we are warned not to sit at the table near the glass doors so that we are not scorched by the incoming sunlight. We opt for a table in the dark, cool interior of the restaurant. 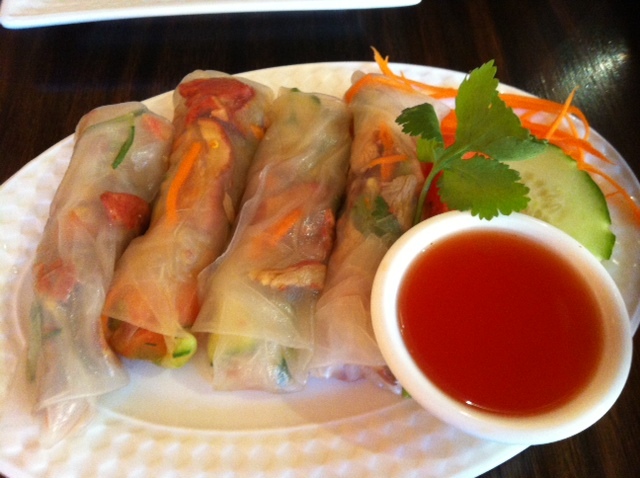 Rice paper rolls are a favourite of mine with their crisp, clear flavours, and the sweet chilli dipping sauce was a perfect accompaniment. I chose this option for its light, healthier qualities, while still being delicious. The fact that he always orders this speaks for itself. The service at Thai on High is always efficient, with water glasses being refilled regularly without asking and meals coming out promptly. Thai on High remains one of our favourite restaurants for a meal out. In the January/February 2016 edition of Taste magazine, there were quite a few Cook It Now! recipes that I literally wanted to cook now. One of them was this chicken curry. 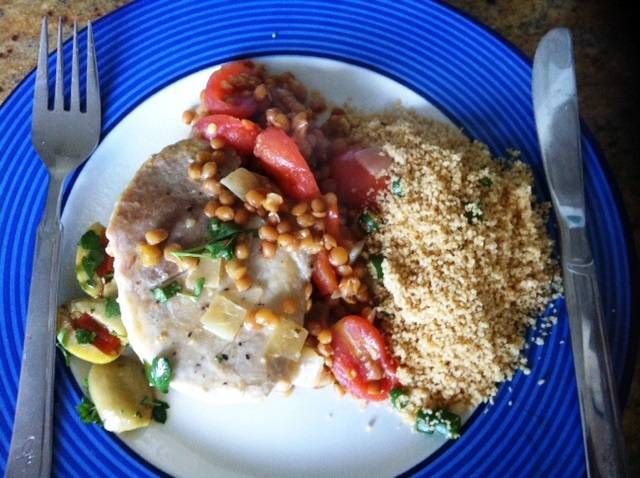 Another recipe that I made was Lentil Braised Pork with Olives. As you can see, it is a bright and colourful dish. It is full of lots of good things, and is only 426 calories per serve, with 15g of fat. It is also tasty. Win, win. Heat the oil in a large frying pan, season the pork with salt and pepper and cook for 3 minutes in the pan or until browned each side. Put the pork on a plate. Add the onion and garlic to the pan, cooking until softened. Add the fennel seeds and cook for 1 minute. Add the tomatoes and cook for another 1 minute. Add the wine and simmer for 2 minutes or until the wine is reduced by half. Stir in the stock and mustard and simmer for 5 minutes. Stir in the lentils. Return the pork to the pan and cook, turning the pork halfway, for 6 minutes or until cooked through. Stir in 1 tbspn lemon juice and season with salt and pepper. 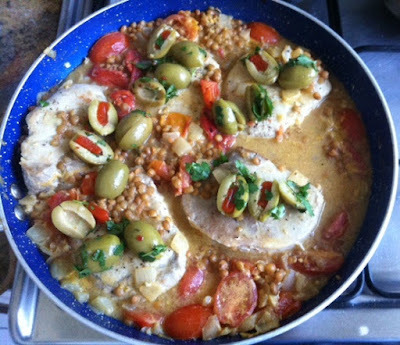 In a bowl, combine the parsley, olives and remaining lemon juice. Serve the pork topped with the olive mixture. Our Eating with Ellie theme this week is Sensational Salads, chosen by Kayte. I chose to make Ellie's Shaved Brussels Sprouts Salad with Hazelnuts and Apricots from Weeknight Wonders. Ellie states that this is a variation on coleslaw, perfect for a barbecue. I simply served my salad with pan fried fish and steamed sweet potato. I was not sure how this salad would go, but I really enjoyed it. The Brussels sprouts have a slightly peppery flavour which makes the salad a little different to the usual, and the apricots add sweetness, while the hazelnuts add crunch. To see what the others made for this week's theme, visit the LYL section of the EwE website. 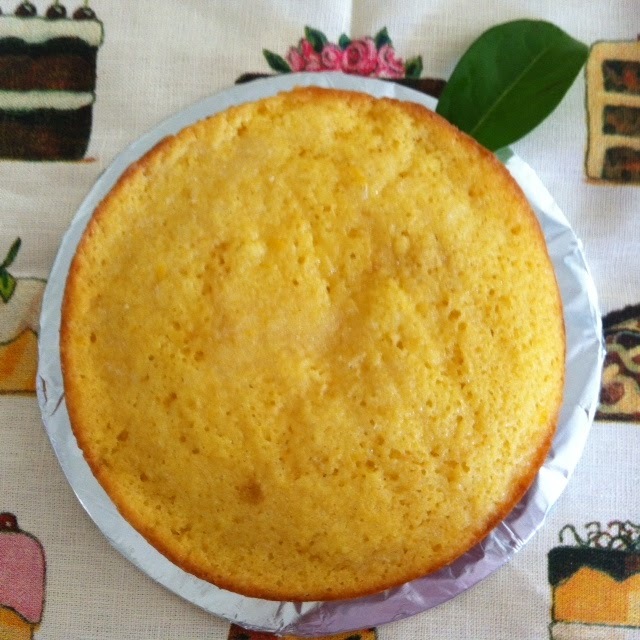 For Tuesday with Dorie this week, I made Odile's Fresh Orange Cake. 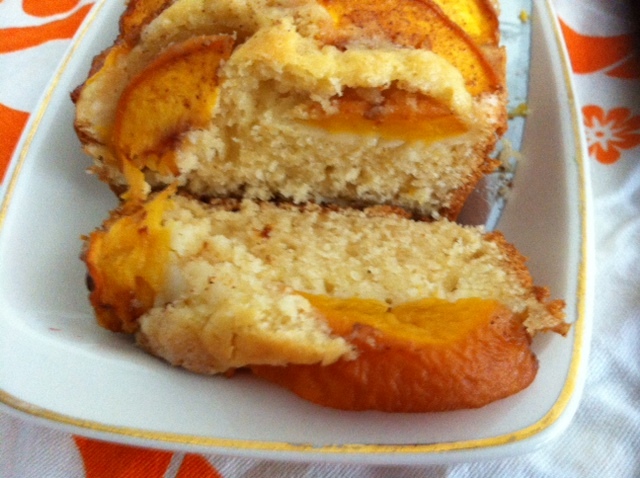 This is just a lovely, light, spongy orange cake that is moistened with orange syrup. You could have fancied this up with poached oranges on top, but I have limited time so left out this optional extra. This is a beautiful cake that is a cinch to make - I'd make it again. To see what the other Dorie bakers thought of this cake (or the alternate recipe, Matcha Financiers), visit the LYL section of the TWD website. I recently found a collection of summer fruit recipes on The Mill House Kitchen blog (via Facebook). I would be happy to make all of them, but the one I chose first is the Melt and Mix Summer Fruit Cake (Recipe No. 10). 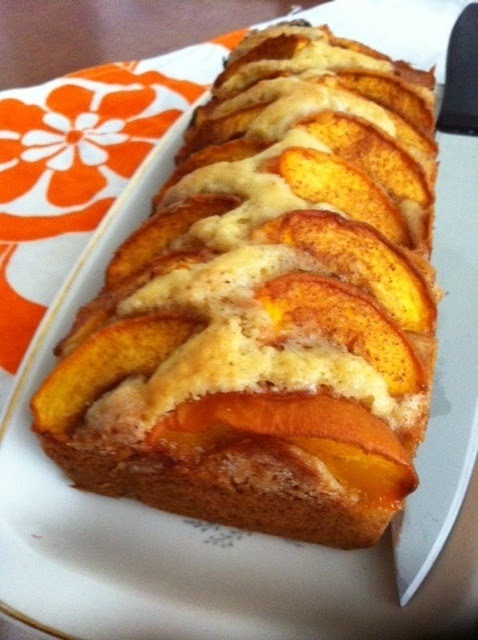 It was the perfect recipe for using up two clingstone peaches in my fruit bowl that were not that nice for eating due to being rather dry. 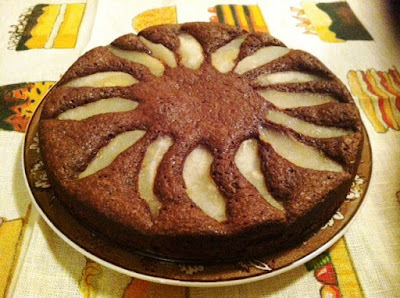 The cake was beautifully light and moist, and was a wonderful vehicle for the fruit (which might otherwise have been wasted). 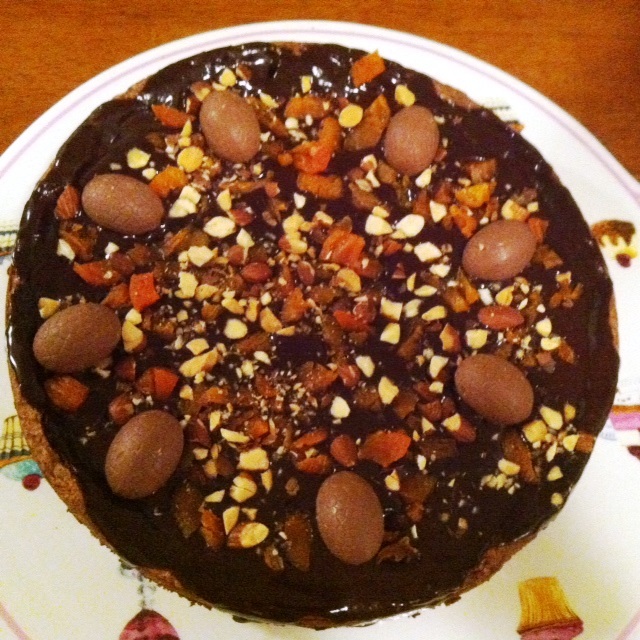 My cake took 45 minutes, not 30, to bake, but otherwise I had no problems with the recipe. 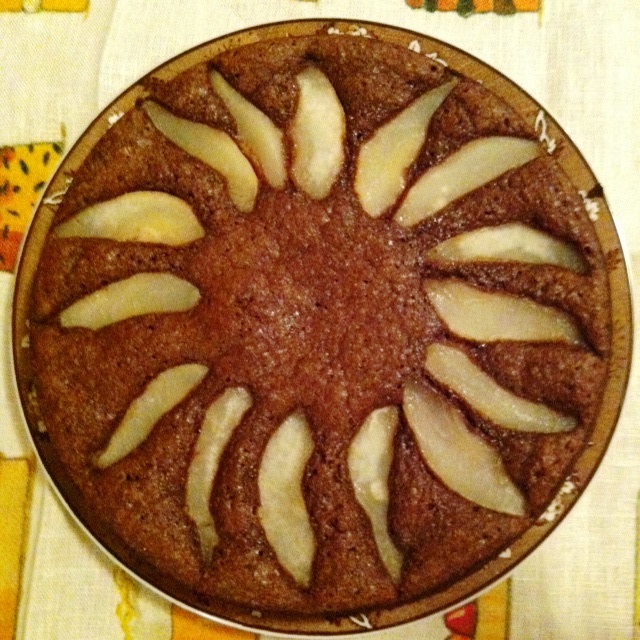 This cake would also be lovely in winter with poached winter fruits, as the authors suggest. Our theme for the Melbourne Cake Club meeting this month was March Madness. I loved this theme - there are so many different directions you could take it. Another new member, Katrina, also came along to check out proceedings. We had a fabulous night of March Madness.